The best contemporary art in the best space: Boston's ICA is an extraordinary showplace for extraordinary art in the Seaport District. Located on Fan Pier, on the east side of Fort Point Channel in the Seaport District (map), Boston's Institute of Contemporary Art is within walking distance of many downtown Boston hotels and the Boston Convention and Exhibition Center (BCEC). 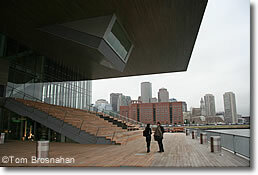 In fact, Boston's excellent HarborWalk is literally incorporated into the ICA building. Contemporary art can be painting, sculpture, photography, installation, film, video, sound, music, spoken word, dance...any type of art at all. Opened in December 2006, the ICA was cleverly designed by the architectural firm of Diller Scofidio + Renfro to be a multidisciplinary art center offering highly adaptable spaces for any sort of work. Because the galleries are on the top floor, they all get gentle, plenteous natural light by means of an elaborate adjustable skylight system and filtering scrims. Although changing exhibits and events usually fill several galleries, the ICA also has its own permanent collection, and gallery space devoted to it. All of the works in the permanent collection are by artists featured in past ICA shows. Besides the galleries, the ICA features a 324-seat theater, a "Mediatheque" with public computers for artwork, design and comments, an Art Lab, ICA Store, and the Water Café, an indoor-outdoor Wolfgang Puck eatery. 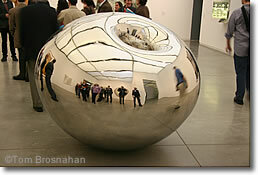 Boston's ICA was founded in 1936, and is thus among the oldest museums devoted to modern art. For much of its life, the ICA was near the Prudential Center in a historic Richardsonian structure. Its present location, on Fan Pier, off Seaport Boulevard near the Moakley Courthouse, several good hotels, the Seaport World Trade Center, Black Falcon Cruise Terminal, and Boston Convention and Exhibition Center, is even more convenient (map). Above, the dramatic cantilevered roof on the waterfront side, with HarborWalk beneath. Below, the top-floor galleries hold all sorts of art.